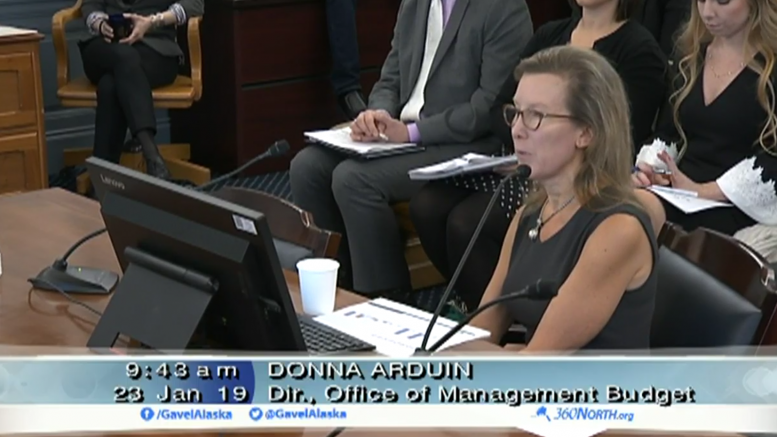 OMB Director Donna Arduin gives a budget presentation to the Senate Finance Committee on Jan. 23, 2019. Gov. Michael J. Dunleavy and his team really do plan on keeping legislators waiting for—and guessing about—the state’s budget until the last possible day allowed under state law. Details about the budget—including just how the administration plans to “match expenditures to revenues” when that means filling a $1.6 billion gap—were scarce Wednesday when budget director Donna Arduin was in front of the Senate Finance Committee. Arduin, who’s raised eyebrows as a conservative budget hawk for hire, was there to talk budget process, and any attempts by senators to ask about the budget itself was met with the same response. “Our proposals and specifics will be available on Feb. 13,” she said in some form or another throughout the meeting, referencing the final day the governor can submit changes to the budget. Even attempts to clarify just how the state will determine which services are “non-essential” or where the administration might be considering to hike user fees to offset cuts were met with the same response. Arduin said part of the budget process would be an internal ranking of services provided by the state to determine which should stay and which should go. When Sen. David Wilson, R-Wasilla, asked if those rankings would be public on Feb. 13, she said no. “On the 13th we will have the outcome of that prioritization, which will be the governor’s budget,” she said. It wasn’t just the lack of details—which appears to have been expected—that riled legislators. High on that list was Arduin’s description of the simplified budget pledged the night before by Dunleavy during his first state of the state address. One way to “simplify” the budget was to combine the two funding sources that have long been separated in the accounting of state spending—undesignated general fund dollars, like revenue from oil taxes and the permanent fund transfer, and designated general fund dollars, like user fees—into a single number. But as would be explained to senators in the following presentation by Legislative Finance Division Director David Teal, combining the two numbers doesn’t actually simplify anything and can instead be used to hide or exaggerate cuts. “There’s a tremendous loss of information when you summarize,” he said. While some legislators seemed deferential to Arduin’s plan to “simplify” the budget, stating that they’d hope to be able to request more detailed information later, Senate Finance Committee co-chair Sen. Bert Stedman was clear the Legislature wouldn’t be playing second fiddle to the governor. Arduin’s presentation was followed by a budget overview by Teal, which amounted to a lengthy breakdown of why simplifying the budget would actually obscure what’s going on with state government. Though Teal made many points, he largely focused on why undesignated general funds are very different from designated general funds. He also gave an example using the University of Alaska’s $30 million in surplus tuition authorization of how changes to those spending authorizations can play tricks with the budget. He said understanding the difference between the two fund sources the Dunleavy administration is hoping to roll into a single number are critical to the Legislature’s decision-making process. A $30 million cut to the university’s UGF would be very different to a cut to the university’s DGF, and the Legislature should understand the difference. 4 Comments on "Dunleavy’s promise of a simplified budget should raise red flags for legislators"
The legislature had no problems when bill walker skewed the numbers to make it appear that he cut the budget. The real issue is the legislature’s reluctance to cut the budget. Deborah L. Holland, you are spot on with “The real issue is the legislature’s reluctance to cut the budget.”. The legislators like to move money around from DGF to UGF and vice-versa. That makes it nearly impossible to figure out–which is their main objective. Another group of funds, “Other Funds”, has also been used in the past to hide money and move money. No more smoke and mirrors with this Administration. Looks like the Kochs have finally completed their takeover of the State of Alaska government.